The pictured Mr. and Mrs. Claus are now 33 years old. Each member of my third grade class painted their own set of this festive couple. What I remember of that day was that we were hurried to get them done and being rushed through this artistic outlet was frustrating to me. Some of my classmates adorned Santa with purple eyes and green hair. We were all proud of our own colorful interpretations of the couple. Apparently after school the teacher caved to her own obsessive compulsiveness, perfectionism, control freaky issues and got a little excessive with touching up these fun characters. The next day when we were allowed to collect our Mr. and Mrs. Claus I could not find mine. My name was on the bottom of these, but I just knew they were not what I had painted. The big give away was the fact that I distinctly remembered painting Santa’s mustache. There were other details that had disappeared to my own artwork and now all that was left was this imposter couple. I remember crying out “Mine are gone! !” One of my classmates picked these up and said well these have your name on them! My teacher tried to console me and said she didn’t change anything only did a little touch up. The words “Well you touched the mustache right off his face!” were what I wanted to blurt out. 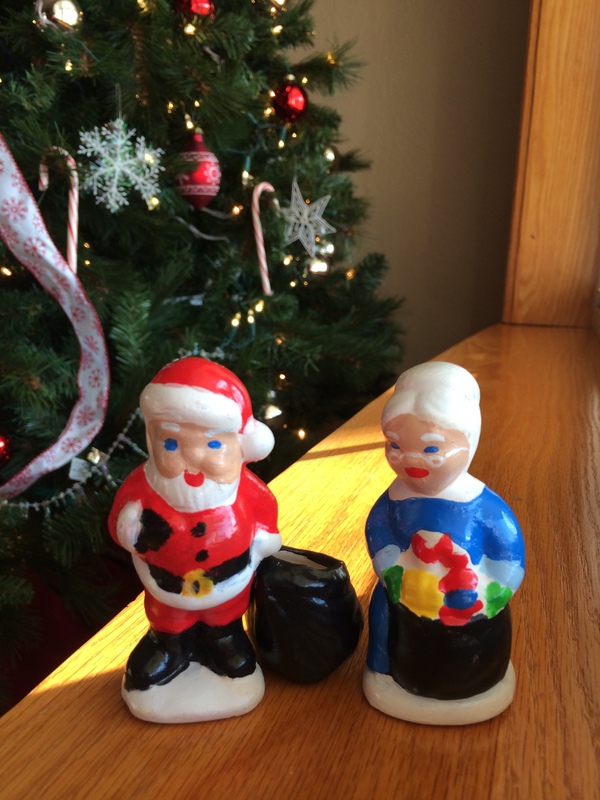 Out of respect I begrudgingly took the imposter Mr. and Mrs. Claus home and they remain in my Christmas decorations to this day. So often as adults, teachers, parents, and leaders we do just what my third grade teacher did. Instead of letting our children learn from mistakes we try to just cover them up, do the work for them, and try to correct issues. This is impossible as we are far from perfect ourselves. In my teacher’s effort to beautify Santa and Mrs. Claus she forgot to repaint his mustache. She couldn’t perfect my work either. What is awesome about God is that He takes us just as we are. However flawed we are He loves us. Other people and things of this world may tell us how and what we need to do to be perfect, but they are flawed themselves. The only perfection is Jesus Christ. He is the only one qualified to cover all of the imperfections of our lives. The thing I love about the artwork of a child is that as they grow you get to see how their skills grow. Coloring goes from purple scribbles all over the page to coloring between the lines. If we try to cover up their imperfections we miss out in seeing their growth and development of skills. God has allowed us to make choices in our lives. No matter how bad or wrong He can bring about perfection within us through His Son Jesus. A small broken sinner comes to Jesus with all the imperfections and Jesus covers all those terrible blots and blunders. As the sinner learns and grows Jesus turns an imperfect life and person into a beautiful piece of art. As the journey of this life ends, the believer finds themselves at the feet of Jesus. It is then that the picture of this life is fully complete. As we learn and grow in our faith we can look back on what we once were and see how God is making a once broken life perfectly beautiful.